The following is a list of notable deaths in March 2019. Zhores Ivanovich Alferov was a Soviet and Russian physicist and academic who contributed significantly to the creation of modern heterostructure physics and electronics. He was the inventor of the heterotransistor and shared the 2000 Nobel Prize in Physics. He also became a politician in his later life, serving in the lower house of the Russian parliament, the State Duma, as a member of the communist party since 1995. The Federal Assembly is the national legislature of the Russian Federation, according to the Constitution of Russian Federation (1993). It was preceded by the Supreme Soviet. Bharat Mohan Adhikari was a Nepali politician and freedom fighter. He became the Finance Minister of Nepal in the 1994-95 government of Prime Minister Man Mohan Adhikari He was the first communist Finance Minister who championed "आफ्नो गाउं आफै बनाउ". He was also the deputy prime minister of Nepal in the Deuba cabinet (2004-05) which was dissolved by King Gyanendra. Ministry of Finance is the central authority of Government of Nepal charged with the responsibilities for maintaining both micro and macro economic stability in the country.The position of finance minister in Nepal is currently held by Dr. Yuba Raj Khatiwada, appointed on 26 February 2018. Derek Aikman was a Belizean politician. He served in the Belize House of Representatives as an area representative for the Freetown constituency in the 1980s and early 1990s. Tom Bass was a Texas politician, professor, and third-generation Houstonian. In addition to his many years teaching at the high school and university level, he served in the House of Representatives and in Harris County government. John Bloom was an English entrepreneur, best known for his role in the "Washing Machine Wars" of 1962–64 when he drastically reduced prices by direct sales that cut out the retailers. His company Rolls Razor made great inroads into the market but several manufacturers obtained injunctions to stop them selling at below the fixed retail price. His operation was also hit by a long postal strike and the withdrawal of a major backer, forcing the company into liquidation. Bloom was a controversial figure whose aggressive techniques shook up a complacent market but who gave new power to the consumer. His often-repeated motto "it's no sin to make a profit" became the title of his memoirs. Rolls Razor Limited was a British company known first for its manufacture of a sophisticated safety-razor and later, under new ownership, an "affordable" twin-tub washing machine. 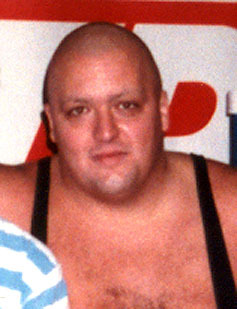 Christopher Alan Pallies was an American professional wrestler, better known by his ring name, King Kong Bundy. He is best known for his appearances in the World Wrestling Federation (WWF) in the mid-1980s and mid-1990s. He wrestled in the main event of WrestleMania 2 in 1986, facing Hulk Hogan in a steel cage match for the WWF World Heavyweight Championship. World Class Championship Wrestling(WCCW), also known as the World Class Wrestling Association (WCWA), was an American professional wrestling promotion headquartered in Dallas and Fort Worth, Texas. Originally owned by promoter Ed McLemore, by 1966 it was run by Southwest Sports, Inc., whose president, Jack Adkisson, was better known as wrestler Fritz Von Erich. Beginning as a territory of the National Wrestling Alliance (NWA), it went independent in 1986 in a bid to become a major national promotion, but was unsuccessful in its attempts and eventually went out of business in 1990. Rights to the pre-1989 WCCW tape library belong to WWE and select episodes from 1982 to 1988 are available on the WWE Network. Richard Alexander Allen was an historian and former politician in Ontario, Canada. He sat as a New Democratic Party member of the Legislative Assembly of Ontario from 1982 to 1995, and was a cabinet minister in the government of Bob Rae. Chu Shijian was a Chinese business executive and entrepreneur, known as the "king of tobacco" and the "king of oranges". He turned the near-bankrupt Yuxi Cigarette Factory into one of China's most profitable state-owned companies and developed its Hongtashan cigarette into one of the country's most valuable brands. At its peak, the company contributed 60% of total revenues of the Yunnan provincial government. Hongtashan is a Chinese brand of cigarettes, owned and manufactured by Hongta Group, formerly known as Yuxi Cigarette Factory. The brand was founded as a gift contributing to the 10th anniversary of the Chinese Communists winning the Chinese Civil War and the proclamation of the People's Republic of China. The following is a list of notable deaths in November 2016. ↑ George Franklin Benson Jr.
↑ Renowned sculpture artist Joe Fafard dies at home in Lumsden, Sask. ↑ Bishop Antonio Menegazzo, M.C.C.J. ↑ Sydel Silverman Wolf Ph.D.
↑ John Wilson Moore, Ph.D.